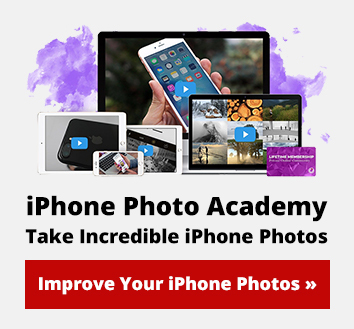 Are you lacking the motivation to go out and find good locations for your iPhone photography? If you want to kickstart your creativity right now, without having to leave the comfort of your own home, keep reading! In this short article you’ll discover ten quick and easy tips for taking incredible iPhone photos in your home! 1. When you’ve found a household object that you want to photograph, simplify the scene by either removing background distractions or filling the entire frame with your subject. 2. Create unique photos of ordinary subjects simply by shooting them from unusual angles, e.g. from low down, from above, from behind, or even from inside. 3. Use natural light from windows to illuminate your subjects indoors. If the sunlight is too strong, use a white sheet, curtain or blind to diffuse the light streaming through the window. 4. At night, experiment with using artificial light sources to illuminate your subject. Lamps, torches, candles, and even the light from your iPad, TV or refrigerator can all be used to creative effect. 5. 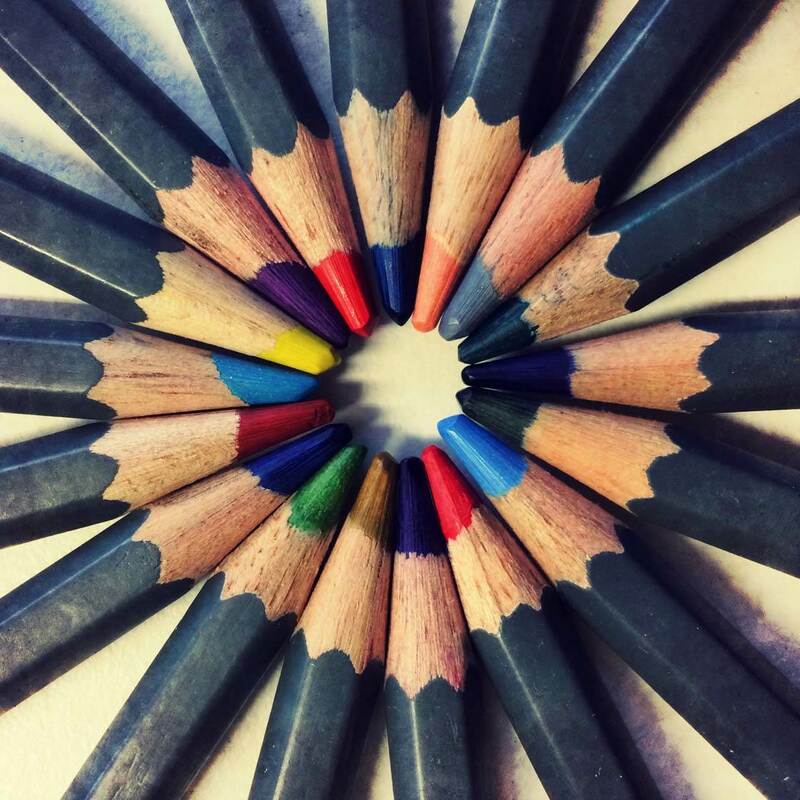 Use color to create a strong visual impact. Filling the frame with the color of your subject will instantly catch the viewer’s attention. 6. Search for objects with interesting patterns that could be used to create unique abstract images. Filling the frame with the pattern will help you achieve this effect. 7. Photograph different kinds of textures to give your photos a tactile quality that instantly brings them to life. 8. Look for shadows that are created by your subjects, such as the shadow of a plant on a wall. Changing the direction and distance of the light source will affect how the shadow appears. 9. Take portrait photos of friends, family and pets using beautiful soft window light to illuminate them. 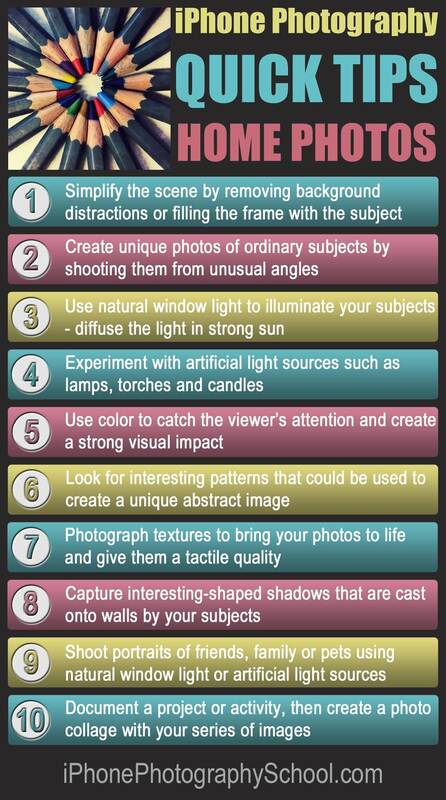 Alternatively, try using artificial light to create interesting lighting effects that highlight the subject’s features. You could even shoot self-portraits if you don’t have anyone else to photograph. 10. Document a project or activity within your home, then use your series of images to create a photo collage using an app such as Diptic. To learn more about taking incredible iPhone photos in your own home, check out our in-depth tutorials and interviews where you’ll discover more great shooting and editing techniques, as well as plenty of inspirational images taken at home!